Specta, what caliber is the 686. I have a 629 in .44 magnum with a ported barrel and 2-3 lb. trigger. If you have the hammer cocked you have to be very careful as it seems like a slight brush will make it shoot. Thankfully I remembered about always pointing the gun downrange..... I'm sure Moose One would love to fill you in on the hair trigger shooting in VT when we get out there. The 686 is .357 Mag with target sights. The trigger is one of the reasons I picked this one. I love it. This makes my 4th .357 and my 3rd 45 auto. 3 more good ones in calibers I like. The M&P .45 is my favorite. It's the most practical for my use. I really like how well it fits my hand but I'll probably never shoot it. :-) Its the first S&W 45 auto that I have liked the feel of. My Colt 1911 has never been fired either and I'm looking at a Remington Rand government 1911 45 auto made during WWII that's never been fired either. I guess I need to keep looking for a 1911 that I can shoot. Remington Rand 1911A1s were only made from 1942 to 1945, and we were still using them in the '80s when I was in the army. Every one of them was about 40 years old, but they took a licking and kept on ticking like a Timex*. There's no telling how many thousands of rounds went through them over the decades. And I've never seen one that hasn't been fired. * Old farts will get this.
. And I've never seen one that hasn't been fired. I guess I will be showing you the first one. I'm looking forward to seeing some pics of it. I'm looking forward to taking ownership of it. And I've never seen one that hasn't been fired. I held the Remington Rand 1911A1 in my hands again today. I've held over 100 different handguns in recent months and the 1911A1 about a year ago. Its not a virgin like I thought I remembered. Still pretty nice. My friend valued it at $2000. I might still take it. We'll see. I put the original stocks back on my new to me 686 after I cleaned it up. It has a raised Partridge front sight and a Whipple rear sight. 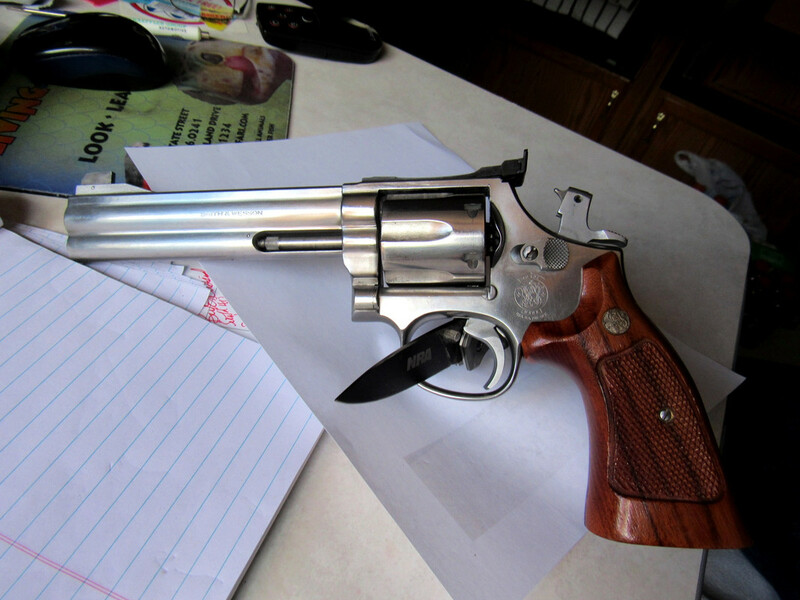 I was told this gun was modified by S&W and my brother (Whipple site) for serious competition shooting.